The late Ken MacDonald studied industrial design at the Rhode Island School of Design in the late 1950’s. After a tour of duty in the army, he spent 35 years in product design and management. He began creating welded sculpture in 1998, converting a large workshop on his property into a sculpture barn. 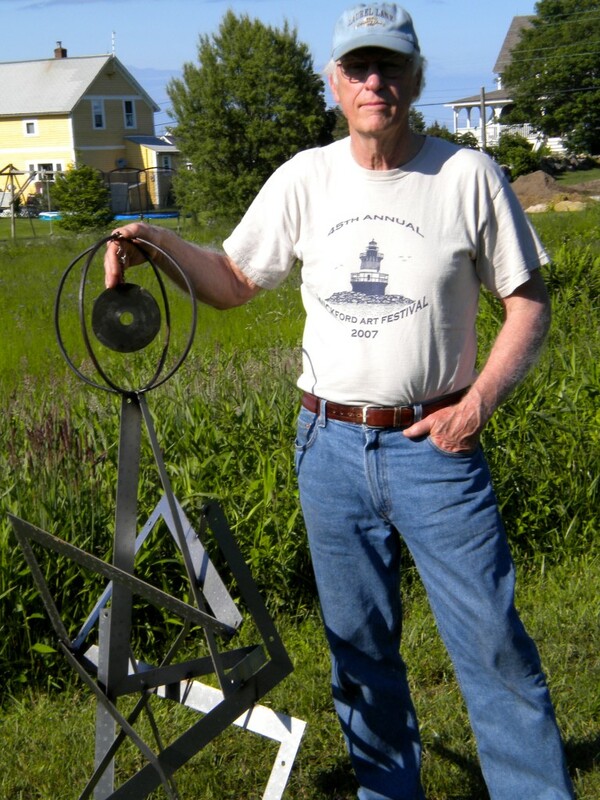 His work has been broadly exhibited and received numerous juried show awards in New England galleries and museums. He was an artist member of the Providence Art Club, Spring Bull Gallery in Newport, the Newport Art Museum, past President and life time member of the Wickford Art Association, as well as an exhibitor at the Wickford Art Festival. Ken’s largest work is a ten foot tall stainless steel sculpture titled “Seaspirit” soon to be installed at the North Kingstown town beach. Other public works include a meditation garden fountain at St.Paul’s Episcopal church in Wickford, a 12 foot fish design bike rack at the Kingstown town library and a large commissioned sculpture for the Providence Art Club. “Found Object” works such as the award winning Time Machine are always happening in the sculpture barn. Hundreds of old recycled parts morph into unique, one of a kind sculptures. He uses a variety of materials, exploring spatial relationships, texture, and treatments to enhance the unique properties of each item. Whimsey and movement often play a part in these pieces, many of which decorate properties from coast to coast. Ken lived and worked in North Kingstown, Rhode Island.